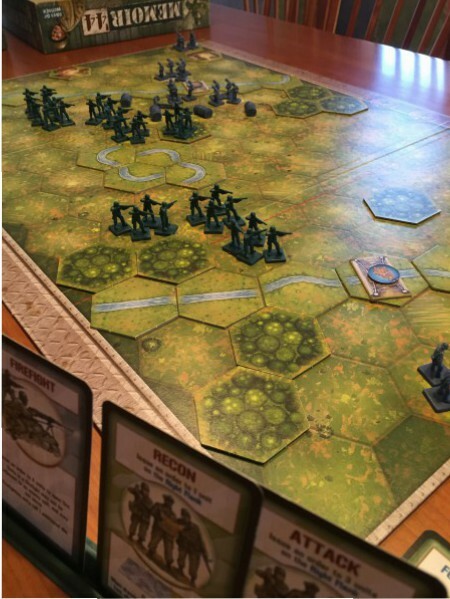 At a recent game night, I had a chance to play one of my favorite games, CO2. I don’t get a chance to play it very often but we have a core group that looks for opportunities to break it out and we don’t hold back at making the suggestion to play when the situation arises. Unfortunately, it can be many months between plays so we usually have to have a quick rules refresher and need to remind ourselves about the tricky handling of CEPs (Carbon Emission Permits) in and out of the market, how the UN Cards work, what happens when scientists get kicked off projects, minimum requirements to build specific power plants, etc. But, over the years, we’re getting better at remembering the nuances and more quickly progressing to actual play. Money, CEPs, Green Power Plants that you’ve built, UN Goals you’ve completed, Company Goals you’ve met, and Expertise you’ve gained all give you Victory Points (VPs), which represent your Company’s reputation – and having the best reputation is the goal of the game … in addition to saving the planet, of course. 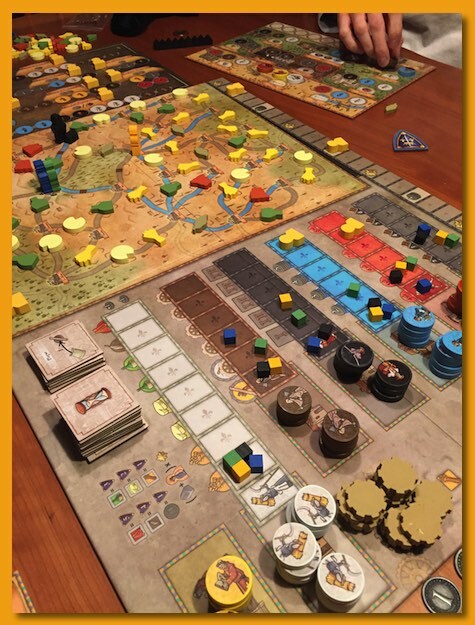 When the game came out in 2012, it was easy to locate forum entries on BGG with topics concerning the game’s theme and its focus on “fictitious” concepts like “global warming”. How ridiculous that games about elves, trolls, gods, etc. didn’t get subjected to the same treatment. Thankfully, those forum entries are now rare and hopefully we all can work together to address our real and increasingly negative impact on our environment. 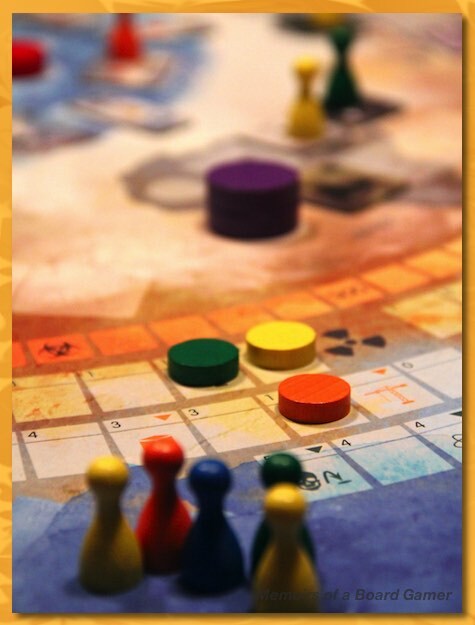 Like the Gallerist, Vital Lacerda’s CO₂ design features a “kick-out” mechanism where players can choose to place a worker (in this case a scientist) on a location to take an action but during another player’s action that worker can be kicked off the location so that the other player can take an action. The kicked-out player gets a benefit for being removed from the spot and, at times, you can take advantage of this timely special action. I like CO₂ for its theme and how the rules strongly tie to real world activities companies and scientists might take that it seems to really click for me. I also really like the twist that if players focus solely on taking actions that only benefit the company they represent (in the short term) and ignore the impacts (or lack thereof) of those actions to the environment, the game can come to a crashing halt and everybody loses due to a crashed earth. The ability to capitalize on building a power plant that another player has worked so hard at designing and developing is simply ingenious. And to top it all off, the artwork is simply beautiful. I hope my images showcase that beauty and help to encourage you to take a hard look at CO₂. Two years ago, when I attended BGG.CON, one of the free games I picked up was Milestones. I didn’t think much about it at the time and in fact, it sat on my shelf for over a year, still in shrink. Last weekend I decided to pull it out and see if it was any good and I was pleasantly surprised. It’s not an awesome game but it’s got enough little things going on that it’s really a pretty neat, engaging game, especially for two. 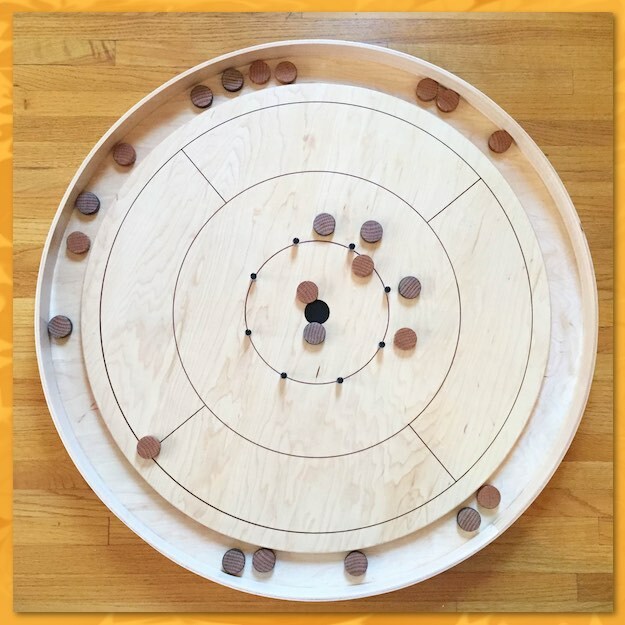 When Lisa and I played, it felt like it was almost always my turn and featured a hint of that tension of wanting to try to capitalize on what moves your opponents were going to make. 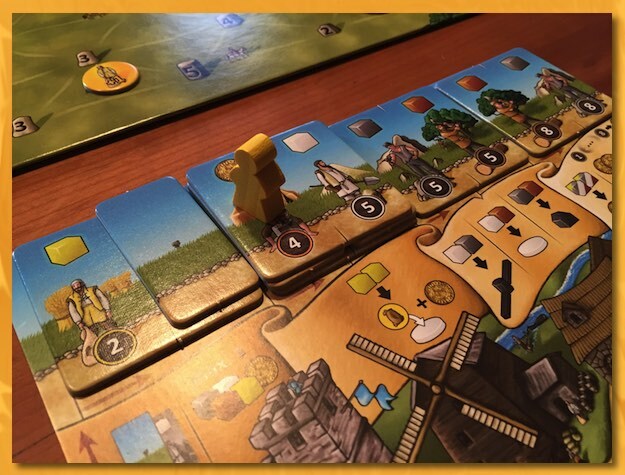 When you set up the game you randomly assign special bonus tokens to various points on the board (these can be earned throughout the game) and then players take turns trying to gain points by building roads, houses, markets, and other items throughout the board. 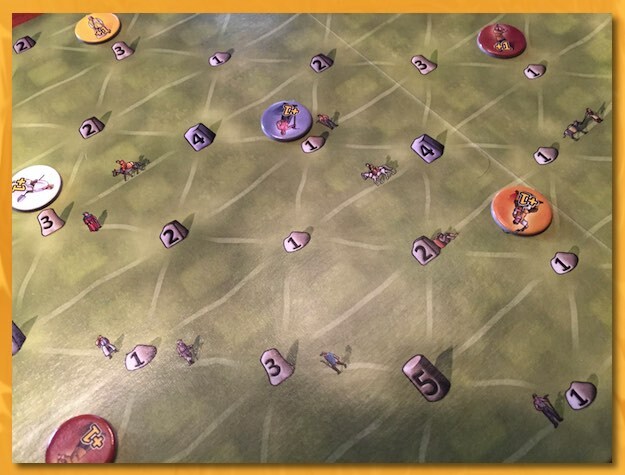 Each player has a personal tableau and a worker meeple that walks in a clockwise circle around the tableau activating actions on what effectively acts like a rondel. 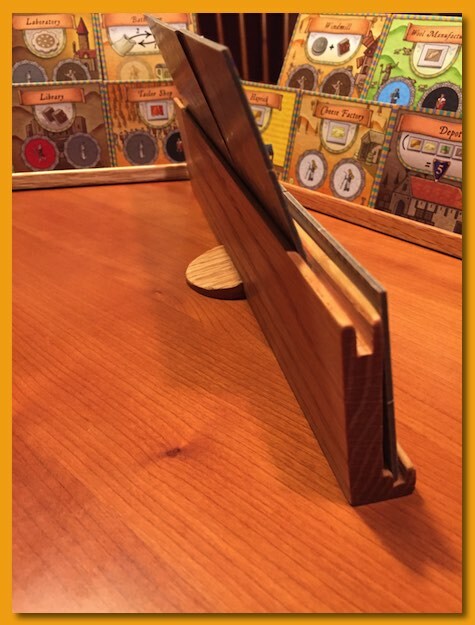 However, unlike many rondel games with a fixed action set, your personal rondel features a top row of actions that change over the course of the game. 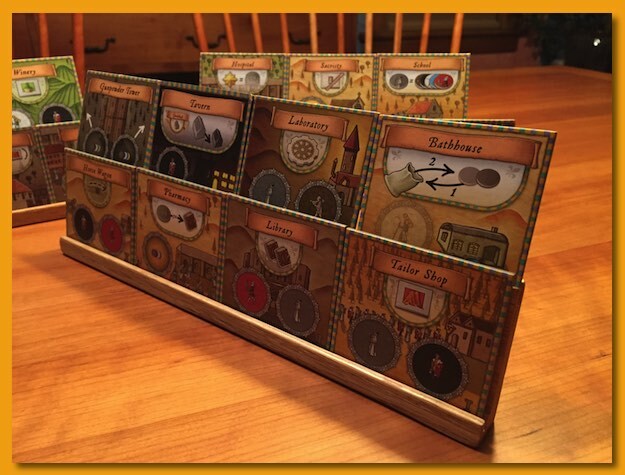 Across the top row, actions allow player to gather goods and then when traversing the bottom of the rondel, actions allow players to spend those goods to build items on the board. 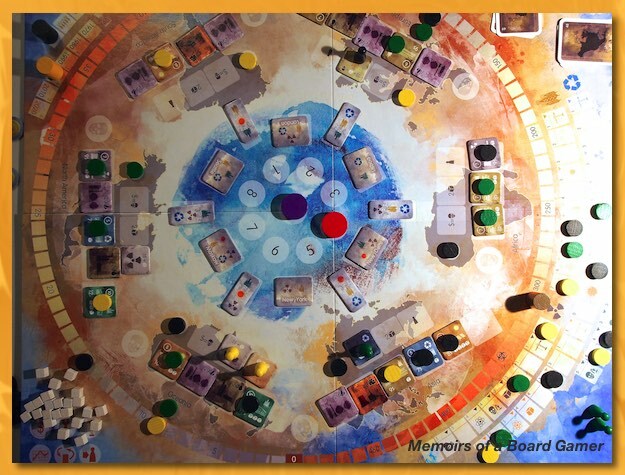 You can travel as far as you want on the rondel with no penalty but you must stop on the lower left corner every time around and on that action space, things get interesting. The ruthless king requires you to donate one of your top row workers to the castle (you cover him up with a small rectangular tile just to the left of the meeple) effectively removing the worker from the game. If that wasn’t enough, the king taxes players restricting them from carrying no more than three goods into the next trip around the rondel. After a few rounds you’ll find yourself with a much decreased capacity to fund your building habit and you’ll need to work towards buying more worker tiles for your rondel. Those worker tiles are chosen from a small supply of face-up tiles and can be placed on top of any of your workers (or “dead spaces”) on your rondel. 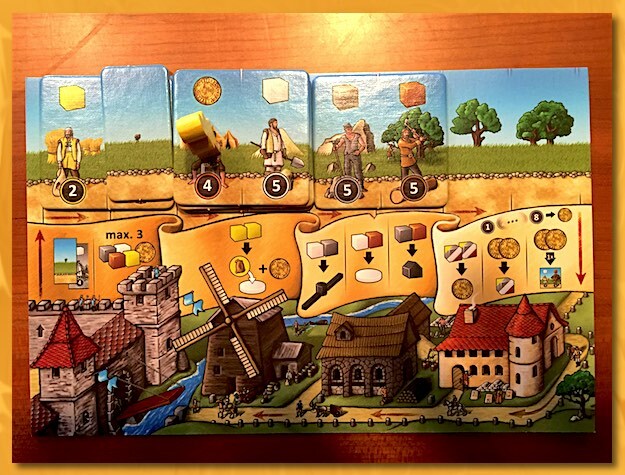 There are additional rules regarding the numeric order of the tiles from left to right as well as what goods they produce, how those good pay out when you stop on them, and how the special bonus tiles from the board pay out. All these rules keep your tile choices interesting. When you build roads, houses, markets, etc., you’ll earn points for covering up numerically valued milestones as well as score points for adjacent uncovered milestones. Lisa and I really enjoyed the game. It’s easy to teach and we both enjoyed the switch between trying to efficiently curate one’s rondel while also timing the placement of built goods to maximize points. What a great game for the amount of time it takes. Nicely done! When I got home from work today, the sun was coming in the west-facing window of our house and I thought I’d share the great shot. 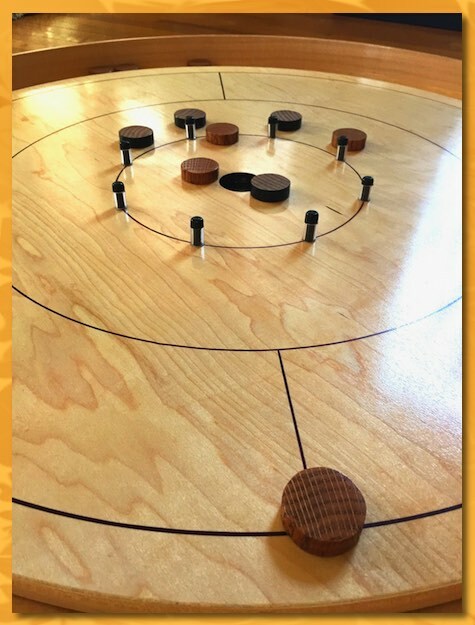 I’ve always been impressed with self-made Crokinole boards. BGG’s image gallery is overflowing with all styles, octagonal and circular gutters, plywood, hardwood, painted, natural, fancy, simple, impressive, crude, … the variety is endless. Regardless of the variety, there’s one common theme: pride. Every one of those boards has had the energy, drive, spirit, and motivation of the maker poured into it, lovingly hand-rubbed, and waxed into the surface. The pride of a job attempted, completed, and well done. It’s a lot of effort, regardless of the outcome, to see a project through to the end and for that, I commend everyone who’s taken on the task of making their own board. I’ve always wanted to make my own but just never, well, just never had the motivation to try. Nothing was stopping me other than just doing it. 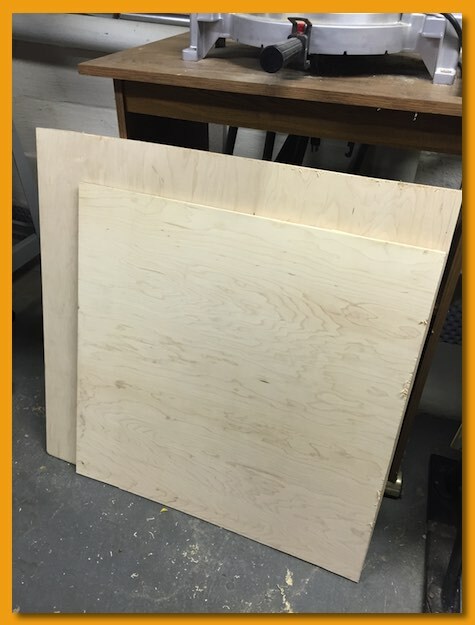 So, last weekend, I found the motivation somewhere inside, and embarked on the journey of making my own board. 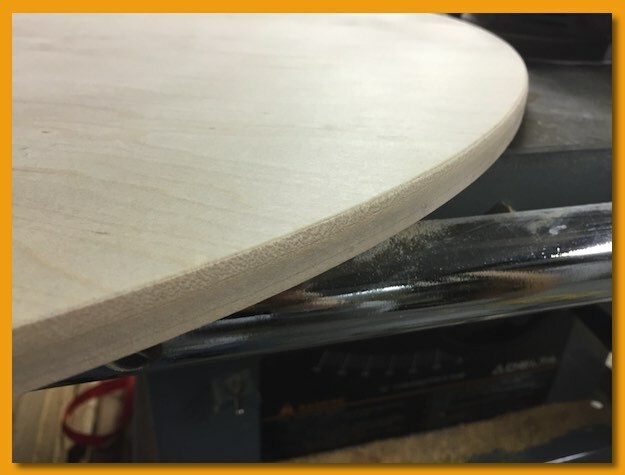 After reading a lot of posts on BGG, consulting the web for other techniques, tricks, and tips, I decided to use maple plywood. I liked the looks of the round gutters so I also purchased an 8′ maple trim piece that I could rip into strips to make the gutter guard. I also decided to leave it natural and make my own discs…more on that later. 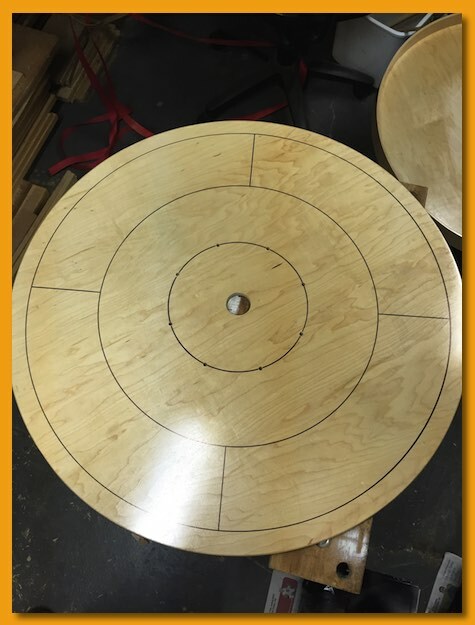 I created a table extension and jig for my band-saw that would let me rotate rough sawn squares around a pivot to make the circular playing surface and the circular base. 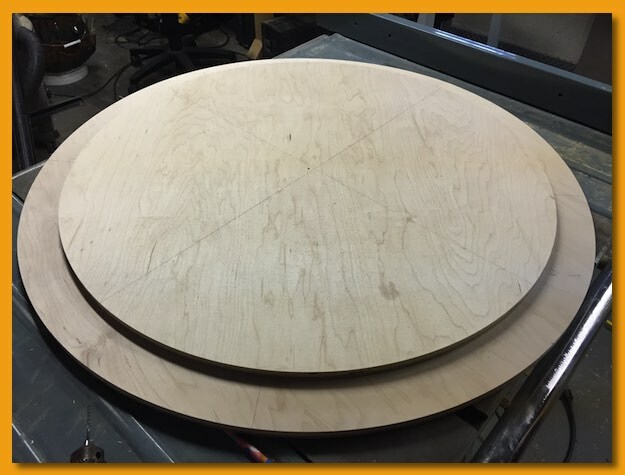 It was crucial that these be exactly circular as I would be wrapping the base with thin strips of maple and I didn’t want any gaps due to an irregular cut. 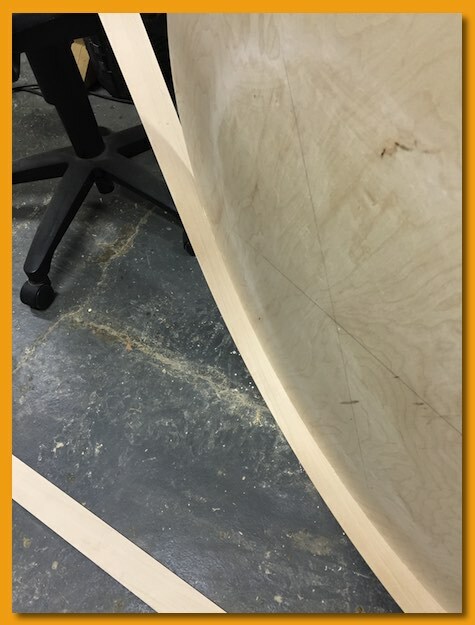 With the circles cut, I turned my attention to the 8′ maple trim. I ripped the face off both sides of the trim piece creating two 8′ strips I would eventually use to create the gutter wall. 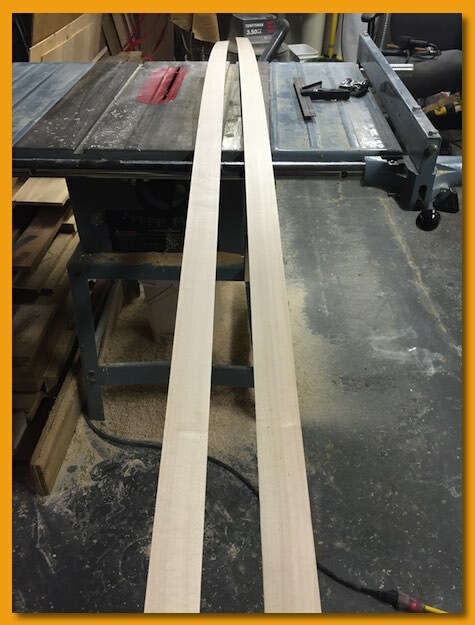 8′ is just barely long enough to wrap the base. 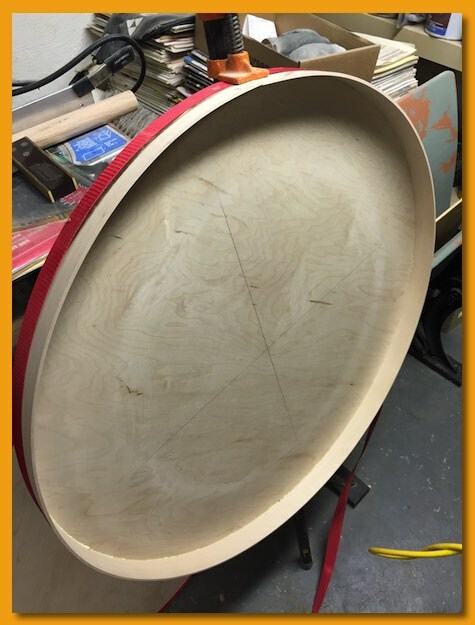 I then got to work on wrapping the circular base with two layers of the bands. I nailed and glued the first layer keeping the clean face towards the inside of the playing surface, wrapped that with a band-clamp. When that was dry, I glued and wrapped the second layer (with the second clean surface facing out) with a band clamp and other ancillary clamps. 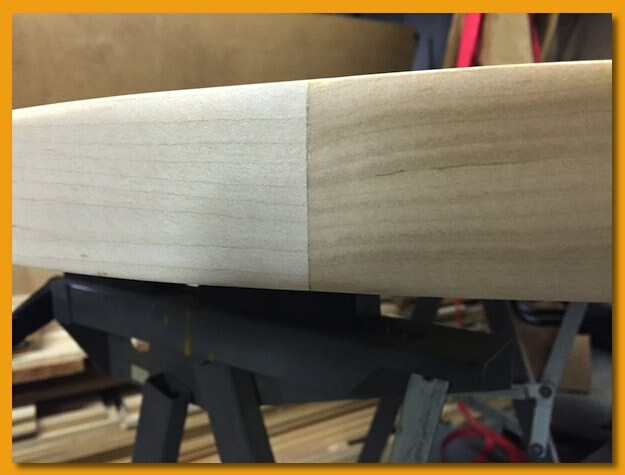 In parallel, I wrapped and sanded the edge of the playing surface with a thinly ripped piece of maple to cover the exposed plywood edge. After the gutter wall was dry, I scarfed the outer joint edges to create a clean joint. 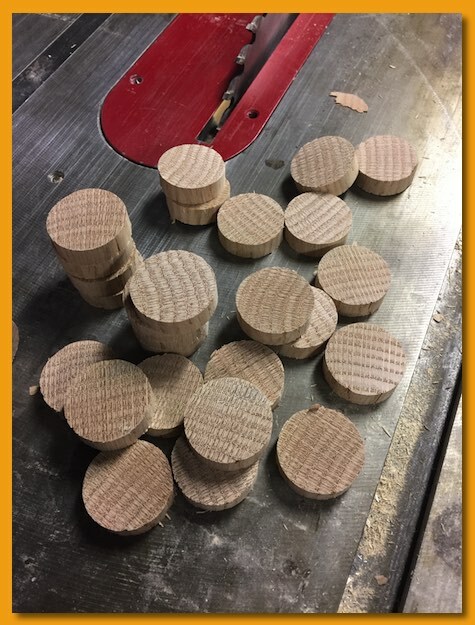 I also knocked out the rough blanks that would eventually become the playing discs. I was really nervous about the playing surface lines. Many hobbiest board-makers use a Sharpie marker but I was really hesitant. 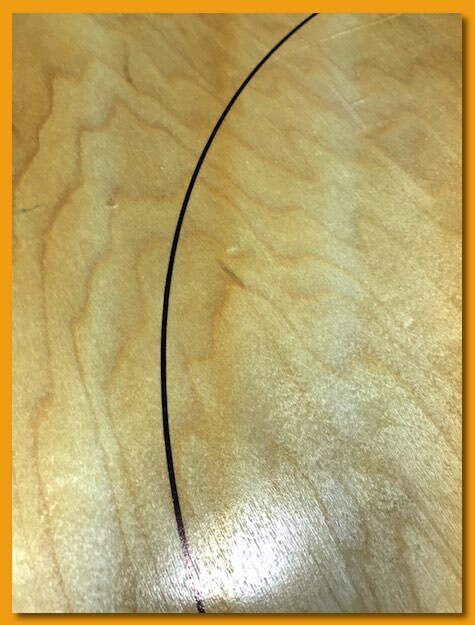 You have to be very careful to prepared the surface appropriately so that the marker won’t bleed into the wood and you need to create an environment to get an exact circle…no wavy lines or inconsistent thicknesses. Professional makers (or those with access to expensive pieces of equipment) route grooves into the surface but I just didn’t see how I could accomplish that without wrecking it. So, I improvised with the help of an old Erector Set Noah had as a kid. With a center pivot hole that tightly fit an axle and pieces that tightly fit the axle extending outward with pre-drilled holes at 1/2″ intervals I was well-prepared to make the Sharpie lines at 4″, 8″, and 12″ intervals. 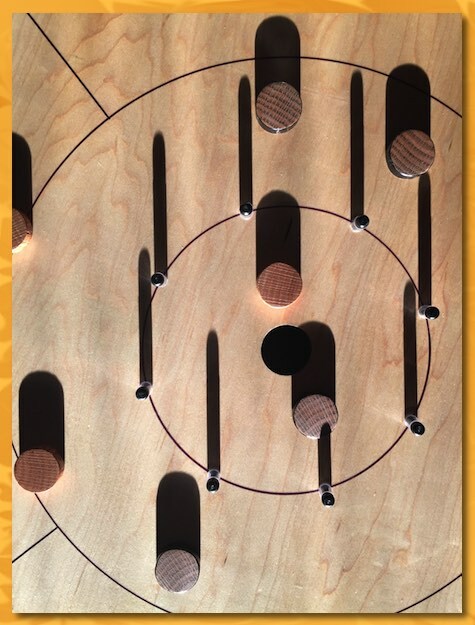 Next was creating the appropriate holes for the 8 pegs arranged around the center line. Those holes are rotated 22.5° from the 90° that define the 4 playing regions. I was getting close now. 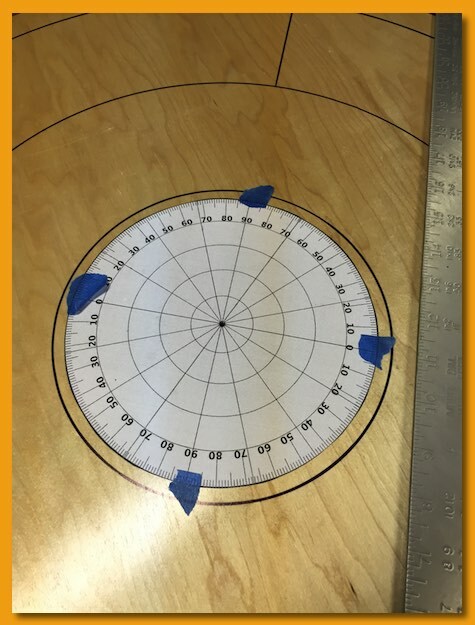 By this time I’d had three layers of poly on the playing surface, then the Sharpie lines, peg holes drilled along with the center hole, and then two more layers of poly. After gluing and screwing the playing surface to the base, waxing the surface with auto-wax to get a nice slippery surface, and installing the pegs (I used wooden ‘toy axles’ wrapped with clear vinyl tubing), I was declaring it done. Overall I’m very happy with the result. If I make another one I’ve got some ideas about what I can do to improve it but I shouldn’t let that detract from enjoying this one. I had some trouble finishing off the playing discs and from the image above it might look like it’s hard to tell the difference between them. However, in play, the sides of one set are black (they look a bit like seaweed-wrapped sushi unfortunately!) and it’s clear which discs are your opponent’s. I also painted the center hole and the interior sides of the hole black to match the pegs. If you ever think you’d like to try making a board, go for it. I found the project entirely enjoyable, nerve-wracking at times (I had heart-palpitations during the Sharpie marking), but completely rewarding. 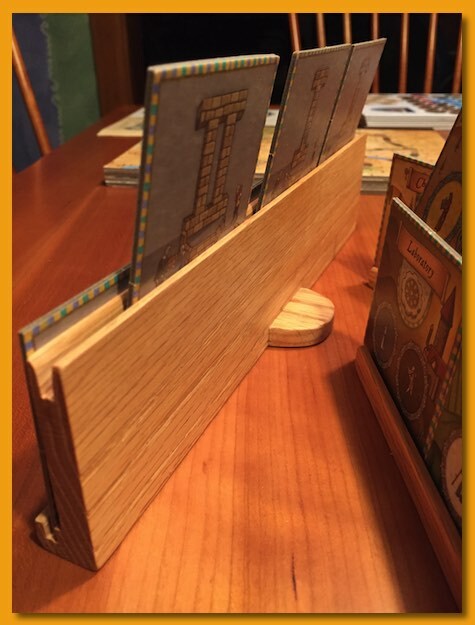 A month or so ago a made a set of three racks to hold the Place Tiles for Orléans: Deluxe Edition. They look really nice and hold the tiles firmly (you can tip the racks severely front-to-back and they won’t fall out) but they’re slightly too vertical and any bump to the rack or table causes some of tiles on the bottom of the rack to tip forward. The tiles stay in the rack, but after tipping forward you can’t see them and it was annoying to keep tipping them back. 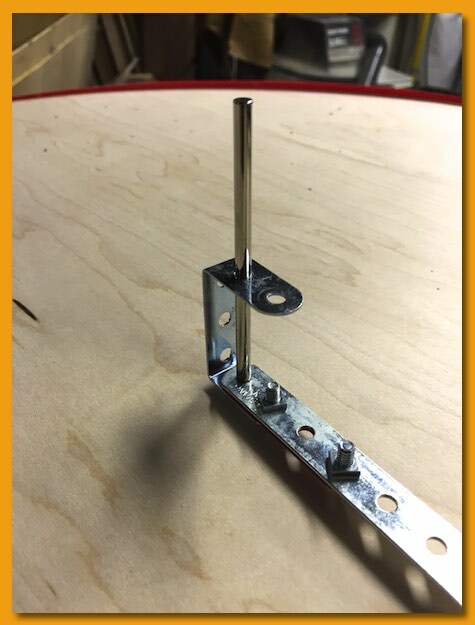 The rack’s stability relies on the small, half-moon, of wood on the back and I wanted to engineer a way to create a bit of a rear leaning angle without compromising the stability of the rack. So, this afternoon, while working on another project (more on that later), I ran the racks through the table saw and ripped a bit off the bottom at an angle and it fixed the problem like a charm. It’s been way too long since I’ve played M’44, so I’m starting back at the beginner’s scenario. Also, testing out the ability to post via my phone. That’s something I couldn’t do with the old website software. Modernity FTW. 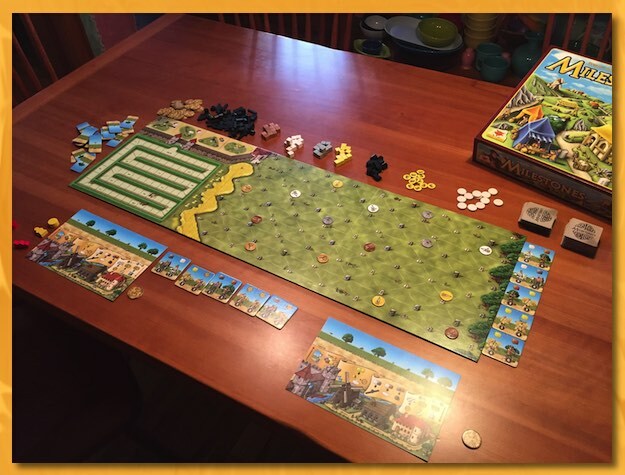 Orléans: Deluxe Edition has been hitting the table a lot with my group. That’s pretty rare, for us, granting the game a relatively vaulted position. Some of the best praise I’ve heard is, “Every time I play it, I do worse which just makes we want to play it again!”. When there are no more character tiles available in a given color, nobody can choose an action that would normally grant them one of those tokens. For example, if there are no more gray Scholars in the University, nobody can activate the “Scholar” action effectively locking out regular movement up the University track until a plague manages to restore a Scholar to the board. Players can, however, still activate Place Tiles that grant additional “books” or “technology gears”. We’d been playing that it was still possible to choose the given action and take advantage of all the benefits but just not receive a character tile. Late in the game, this is many times a welcome relief since it doesn’t muddy your bag with unwanted tiles and doesn’t prohibit a catch-up mechanism for those that waited for a given benefit. No wonder it’s not allowed! When you receive one or more technology gears in a turn (by choosing an available Craftsman and/or activating the Laboratory) you must wait until the end of the round (after you pass) to place the gear(s) on empty locations. This rules miss didn’t impact anything in our games but simply clears up some questions we had. We’d played correctly that placing the gear when you immediately receive it would NOT activate the space and that the space must be empty but we weren’t waiting until the end of the turn. I’m not convinced I like the Beneficial Deeds board. It feels tacked on and nobody in our group tends to pay much attention to it until late in the game. It’s common for us to only complete 1 or 2 places. The “game of chicken” seems, to us, the inhibiting factor. If the Citizen was granted to the player with the majority of character tiles in a location, it might completely solve the issue for us. However, we don’t usually “house rule” games since doing so can dramatically change the game in ways that were never intended (I’m looking at you Monopoly). The Deluxe version is very nicely produced but I do wish there was more of a need to use the metal coins as currency in the game. With metal tokens like that, there should be a need to fondle them more. Thanks Reiner Stockhausen for a great game, I can’t wait for another play. Deck building by drawing tokens blindly from a bag! Nicely done!